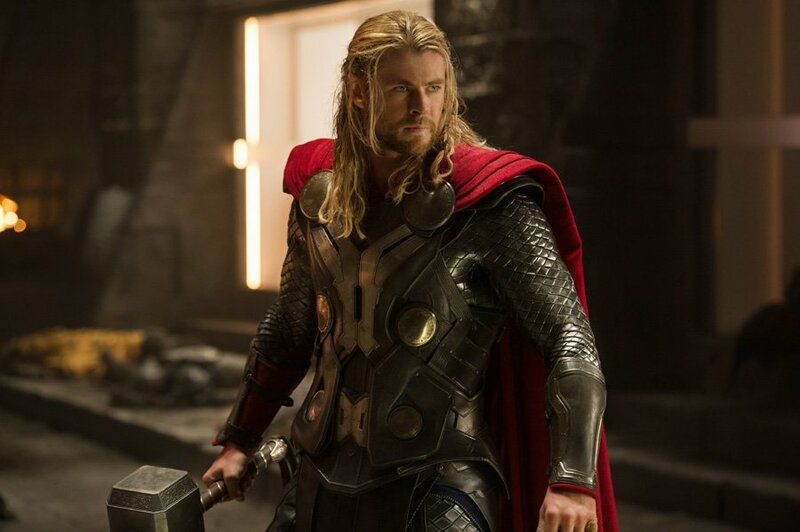 Thor, as played by Chris Hemsworth in Marvel Studios films, is much different kind of animal than the other champions that unite to create the superhero team known as The Avengers. Sure, each member has their own special unique backstory, be it a tale of gamma radiation testing go wrong or the construction of special flying armor in a Middle Eastern cave, but what truly separates the God of Thunder is that he is, as he would say, “not of this Earth.” He’s an Asgardian prince, a mighty alien with godly powers who travels across the stars so that he can protect our planet from foreign invaders. He opens up the Marvel Cinematic Universe to other worlds and other galaxies – and that’s where I got to go last year when I visited the set of the upcoming Thor: The Dark World. Leaving my Los Angeles home a week before Halloween, I took a 10 and a half hour flight to London, England, where I along with a small group of other film journalists were given the chance to fully explore the ins and outs of the production behind the forthcoming Marvel Studios sequel. The set visit spread across two days, we visited multiple settings from the film, watched cameras roll, visited the various and incredible art departments, talked with the stars and director Alan Taylor, and much, much more. Wasting no time at all on the trip, upon landing on the ground at Heathrow Airport we took a long van ride out to Surrey where we got our first glimpse of the production at Longcross Studios. Entering into an expansive section that the crew had nicknamed “The Medina Set” (a name that didn’t seem to have any real meaning) we had our first chance to truly step into Asgard. Dusty and sand colored, the first area of the huge set was described to us as a training ground where the soldiers of the realm would learn to use their weapons and prepare for battle. But as the film’s director would explain to us the next day, Thor: The Dark World aims to open up the world of Asgard and show it as a multi-dimensional place, which was an element also on display on the Medina Set. Overlooking the training ground is a pub where the audience gets the chance to see the people of the kingdom act as a community. The space had wooden walls and columns, and was beautifully decorated with stone and gold archways and golden fabric that hung from the ceiling. In one scene in the film we will see the burly Volstagg (Ray Stevenson) being merry and recounting tales of combat in the pub, and also Thor out of his war armor and in his downtime clothes. It all delivered the sense of not just being in another world, but in another century. From the Medina Set we moved to another area of Longcross, this time inside one of the studio’s giant stages. Described to us as the Asgardian dungeon, the set was constructed almost entirely out of intimidating dark gray stone… with the exception of the prison cells. Instead those were pure white and glowing with light. The far side of the giant dungeon was a big blue screen, but on our side we stood alongside a pair of detailed columns as well as a massive, ornate door. As we’ve seen in the trailer and stills, this will be the home of Loki (Tom Hiddleston) for at least part of the movie. While on the dungeon set we got to see second unit director John Mahaffie (who also worked on The Avengers) film a scene involving featured a new group of characters that will be introduced in Thor: The Dark World: the marauders. Covered in black armor and spikes that made them look monstrous and dangerous, the group was described to us as being nomad space pirates who are armed weaponry they’ve picked up from all across the universe - from maces and axes to Chitauri blasters. In the scene we saw them film, a small group of four marauders charged down the hallway of the dungeon towards the giant door, and they were followed by a giant group of more marauders that poured out of one of the cells after them. We weren’t told explicitly what they were doing in the dungeon, but it didn’t seem as though they were keeping the peace. Our adventures in Asgard didn’t end there, as we got to see two more areas of the golden alien world on second day of the trip at Shepperton Studios (the legendary studio where they filmed classics such as Star Wars Episode IV: A New Hope, Alien, and Blade Runner). The first set we saw was made to double as two different locations, The Hall of Science and the chambers of Thor’s mother, Frigga (Rene Russo). Continuing the pattern from the previous day, the stage was enormous and lavish, decorated in gold and featuring incredibly detailed markings along the walls. At the center was a large, octagonal planter we were told would eventually be the location of the Tree of Yggdrasil. The space was so big that it even had four rooms that branched off from the middle section. The other set we got to walk through was one we have seen on the big screen before: the Asgardian throne room. 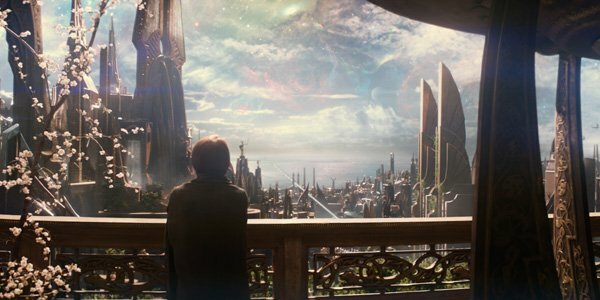 Fans should remember that the palatial space was featured throughout the first Thor movie, but for the sequel they were forced to build it all once more from scratch, using the designs from the first film. The setup was built in Stage H, which is not only the largest stage at Shepperton, but also the most famous: it was previously the home of the awards ceremony scene at the end of Star Wars . To give you a sense of scale for the room, the entire place was littered with 35 foot tall columns that will be extended to 75 feet with the help of CGI in the finished film. Like Kenneth Branagh’s film, a good percentage of Thor: The Dark World will also take place on Earth - roughly a 50/50 split according to producer Craig Kyle. And while the sights of Asgard made up most of what we got to see, we got a taste of our own world as well. Instead of being partially set in New Mexico, this time around most of the terrestrial scenes in the movie will be taking place in London, which happens to be the city where Jane Foster (Natalie Portman), scientist and girlfriend of Thor, just bought a flat. Her studio apartment – which we were told would probably cost about a million pounds in the real world – was fully constructed on one of the soundstages and screamed “astrological physicist” - there wasn’t a single corner of the entire place that wasn’t touched by Jane’s profession/obsession. A large, white telescope hung out by the window, articles about Einstein-Rosen Bridges sat on the coffee table in front of the TV, and a newspaper clipping about an asteroid on a collision course with Earth was stuck on the refrigerator with magnets. There was also another article titled “Citizen Narrowly Escapes Death On The Streets Of New York” which featured a blurry cell phone image of our favorite God of Thunder. My favorite detail, however, had to be the item featured on the bedside table: Jane Foster may be a genius who invented a great deal of her own equipment for her studies, but she also still rocks a Discman. 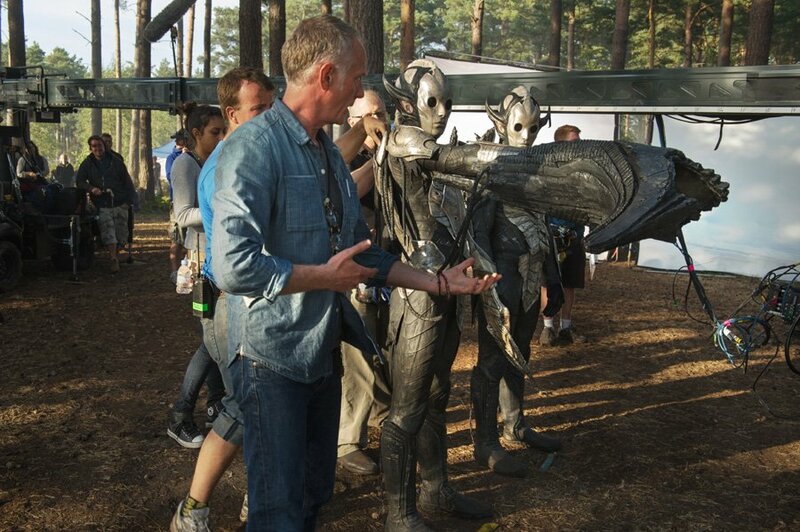 Moving from the Earth to the stars, we also learned that Thor: The Dark World will be the first movie in the Marvel Cinematic Universe to take us aboard a spaceship – namely the crafts controlled by Malekith the Accursed, the film’s central villain played by Christopher Eccleston, and his army of Dark Elves. 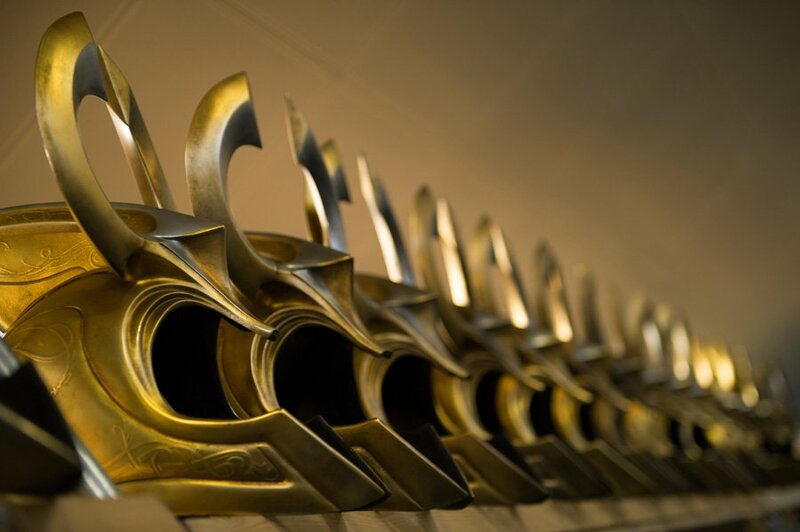 While Malekith’s fleet is largely made up with vessels called the Horus, the flagship is called The Ark, and that was the one we had the chance to go inside during shooting. The scene began with Malekith stumbling as he made his way towards the bridge of the ship, his left hand pressing against the wall to balance himself. The entire place has a very strong, dark H.R. Giger vibe. He walks forward to a railing and the camera rotates around his head, which will give us our first look at the leader of the Dark Elves without his mask on in the film. His white hair is tied into two braids that meet and combine to become a ponytail that hangs halfway down his back. His skin is ghostly white, his eyes are a piercing blue, his ears are long and pointy, and his body is covered in a dark armor. Algrim The Strong (Adewale Akinnuoye-Agbaje), Malekith’s second in command, comes up from behind his superior and hands him a mask. As the two of them stand on the bridge, they begin to converse in Elvish, and while we didn’t get a direct translation a dialect coach had actually been hired by the production to create the language. We even got two bits of trivia out of watching the scene: at the start of each take Alan Taylor would cue up the main theme from Hans Zimmer’s Inception score to set the mood, and weirdly enough Eccleston was barefoot during the shot because they frame doesn’t show his feet and the character’s boots were too time consuming to put on. But who exactly are the Dark Elves? Where did they come from? What role do Malekith and Algrim play? While the actors and filmmakers remained rather tight-lipped about exactly what it is that the Dark Elves have against Thor and the Asgardians and the details of the villains’ plan (secrecy is a big thing for the folks over at Marvel Studios), what we did get a great look at was the incredible makeup, prosthetics and prop work that was being done to bring the aliens to life. 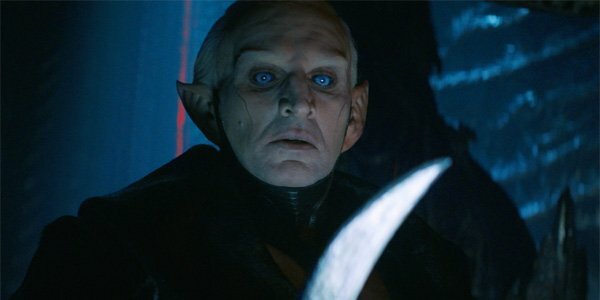 In creating a live-action version of Malekith one of the major considerations was in crafting the character’s most notable physical attribute: deep scarring that covers half of his face. While he won’t be sporting the battle damage for the entire movie, the signature look is featured. Heavy facial makeup and prosthetic application obviously has its specific challenge for an artist, as their work has to ensure that the actor underneath will maintain full motion to speak and express emotion, but that was a challenge readily accepted by special makeup effects designer David White in crafting the process of how to get Eccleston became a Dark Elf. While there wasn’t enough time to talk with Eccleston on set, as he was too busy fulfilling his on-set duties getting into make-up and wardrobe for his scene, Kyle spoke highly of the actor and his performance in the film, acknowledging the high bar set by Hiddleston’s performances in both Thor and The Avengers, and making kind comparisons. As Algrim The Strong, Akinnuoye-Agbaje underwent a similar make-up and prosthetics process as Eccleston, but those familiar with the character from the comics know that he takes on more than one form. In the movie the character is at one point transformed into Kurse, a being who, in the comics, is completely driven by his desire for revenge against Thor. After getting the chance to speak with Chris Hemsworth on set the first day that we arrived in London, the Akinnuoye-Agbaje actually ducked his head into the press tent in his full Kurse makeup, and the honest truth is that the performer was completely unrecognizable in the costume. A much different design than what is in the comics, the movie version of the character looks like a hell spawn demon beast. While the design is mostly black, there are accents of red as well, with the character’s head covered in multiple long, curved horns. If you were to see him on the battleground, your body would begin to run away even before your brain finished processing what it was looking at. This is only the tip of the iceberg in our Thor: The Dark World set visit coverage. 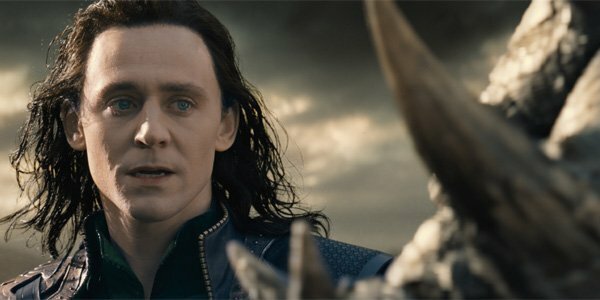 Want to find out about Loki’s role in the film and the strained relationship with his adopted brother? 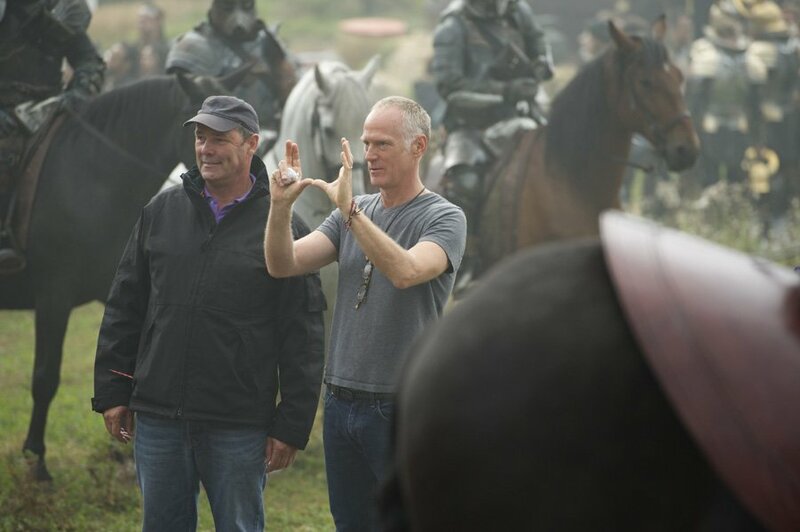 Want to know how Alan Taylor’s work on HBO’s Game of Thrones affected the look of Asgard? Want to know what it was like for Akinnuoye-Agbaje to undergo the Kurse transformation? Be sure to stay tuned today and later this week to learn more about the epic-looking new movie and travel further into the Marvel Cinematic Universe. 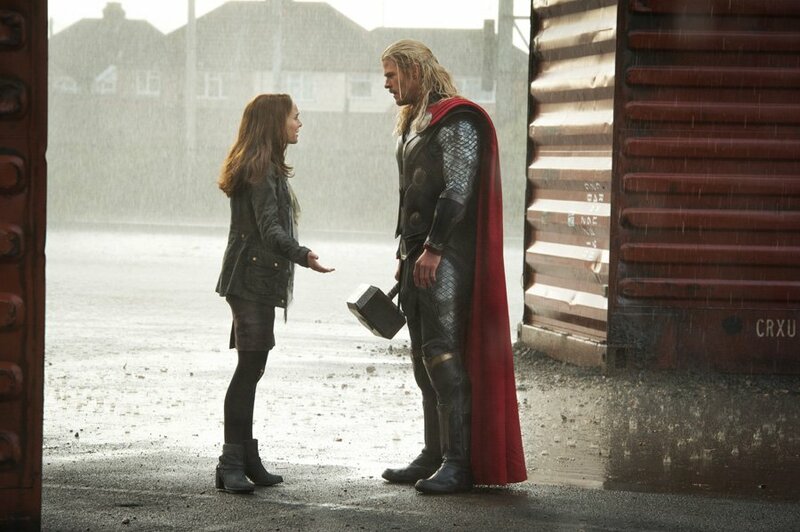 In the meantime, if you haven't already, be sure to check out the full gallery of new Thor: The Dark World images below!